This is the 20th set of words for The Craft Barn's Quotes and Lyrics Challenge - DESTINY and/or GIFT. For my postcard this time I decided to go for this hymn as it was the first song that popped into my head. I've recently been re-watching Alias Smith and Jones on TV and this is one of the songs Pete Duel sings in that. I've just used 3 lines on my postcard but there are a couple more verses below - I was thinking of doing the valley of love and delight or friends but decided to go for the easy option and just do a set of gifts. 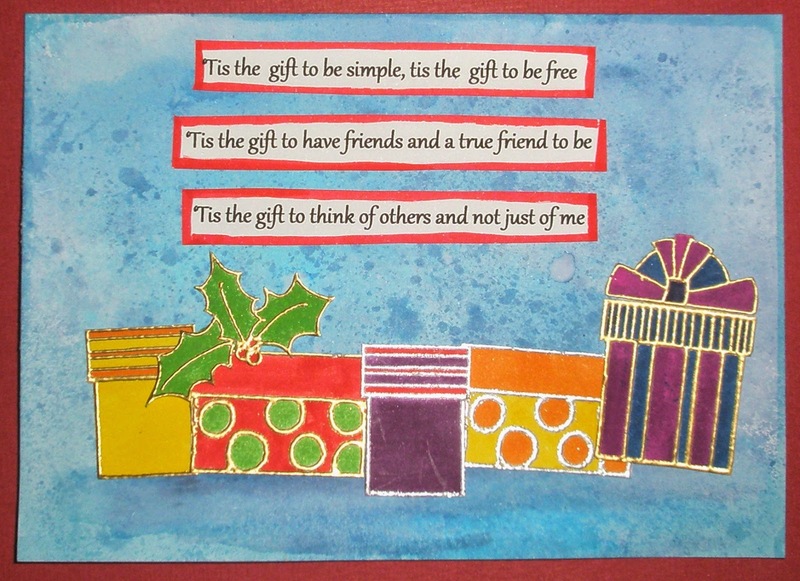 The stamps are the Christmas Parcel set by Oak House Studio coloured with markers and the background is a mix of Distress Stains. 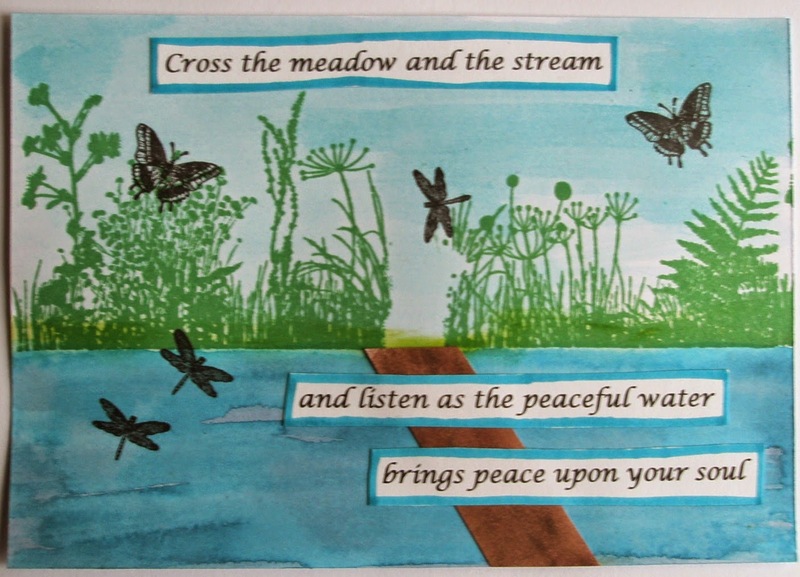 I've managed to catch up with week 17 too where the choice of words was PEACEFUL and/or GRACE - I chose this quote by Maximillian Degenerez and used various inks and stains to create a peaceful riverside setting ......well that's what it's supposed to be!! Thanks for popping by and leaving comments - they are always appreciated! Well done for catching up - I still have one to do. I loved Alias Smith & Jones when I was a teenager & I caught part of that episode a few weeks ago. I like your colourful presents and the scene you have built up in the 'peaceful' postcard. Wow, I feel like a fish out of water, since I had never heard of Alias Smith and Jones. Had to do an internet search for it. That aside, I adore your latest postcard and your gifts are far more gorgeous than the one I made. It was also good to see your week 17 entry. It was a very peaceful scene you created. Two great postcards, I don't know the song in the first one, so I'm going to find it - probably on YouTube! Your catch up is fab - can almost hear the soft tinkling water. Oh, wow, I used to love watcing Alias Smith & Jones as a young teen, my sister and I would 'fight' over Pete Duel, haha. Both great pages, well done for catching up! Great postcards - now Alias Smith and Jones is taking me back a bit (a long way...!) well done for catching up too. Lovely cards - both of them! Two lovely postcards. I like the way you have created your tranquil scene on the second one. These are two fabulous creations. Both of these are lovely! Good for you for catching up, too! I love the splattered effect of the background of the gift page.